Today is the DeNami Design team's final Product Spotlight for the year. We are featuring the Winter Wreath cling stamp. Just wait until you see how versatile this stamp is! I stamped my Winter Wreath in Vintage Sepia Versafine ink and then decided to dress it up by overstamping it with images from the indispensable Classic Christmas stamp set in Vintage Sepia, Olympia Green, and Satin Red Versafine inks. I broke up the beautiful Christmas Wishes sentiment into two lines so that it would fit in the center of my wreath ;). All I needed to finish off this card was some pretty patterned paper, a DeNami Boutique Button, and a bit of red & white baker's twine. Easy! Looking for some more ideas for this lovely wreath stamp? Be sure to check out the rest of the team's marvelous creations today on the DeNami blog. Like what you see? 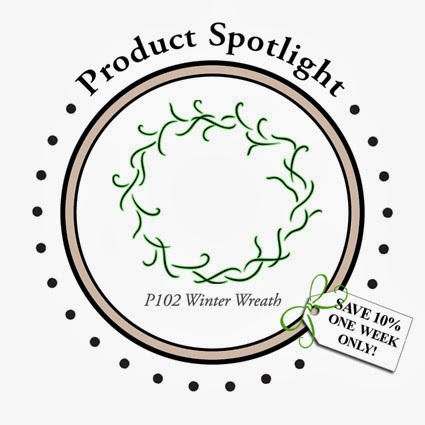 Then you can score a great deal on Winter Wreath--as our Spotlight Product, it's on sale at 10% off for the next week!! Gasp! This is stunning Emily! I love the way you fussy cut it out! A traditional beauty! Just love the Christmas wreath you made! Those little red berries are the perfect touch! Emily, you really did dress up that wreath with your overstamping. I thought that was the way it was supposed to be until I saw the stamp. Wow! Go, Em! Great job fussy cutting, too. I thought it was a die. Ooooo...I love how you added the pine sprigs and holly to your wreath!! So pretty!!! Beautiful traditional card Emily!! It reminds me of a cozy country Christmas!! I noticed your card right off at the DeNami Blog, Emily. By adding the other images you totally changed the look of the wreath--love it! This is one of my favorite cards! This is so pretty. Love the holly berries you stamped on it and the patterned paper is great.